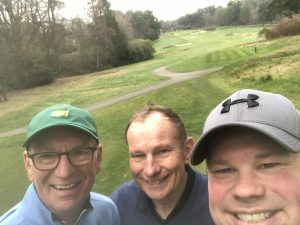 March 22nd 7.30am and the Fuellers golf team comprising of Russel Warburton, Tim Woods and Dennis Woods arrived at Swinley Forest Golf Course in Ascot Berkshire to play in the Worshipful Company of Horners Spring Golf Day. Swinley Forest is one of the most prestigious golf courses in the world with a membership list right out of Debrett’s. The golf course is challenging but fair and as you can imagine, very well maintained. Russel, Dennis and Tim standing on the 18th tee with the prestigious Swinley Forest Clubhouse in the distance. The day started in the bar being welcomed with coffee and a very enjoyable bacon roll. Swinley is well known for its food and wine; more on that later. of Debrett’s. The golf course is challenging but fair and as you can imagine very well maintained. The team captain and Fuellers Golf Organiser Russel managed to prise the others away from their coffee and out onto the practice area being ready to tee off promptly at 8.32am. The morning was dry with a slight chill but the winds of recent days had gone, so perfect conditions for golf. The competition in the morning was for an individual prize so each player is working on his own score and not playing as a team. All 3 Fuellers playing together got off to a good start scoring well on the first hole. This set the trend and by the half way stage the scores for all 3 were very close with Dennis just staying in front. After a pleasant stop for a hot Bovril and an energising Mars Bar at the half way hut our 3 Fuellers representatives started their journey back to the clubhouse playing the final 9 holes. The back 9 produced better scores with Russel scoring 20 points on his final 9. Back at the clubhouse, there was time for a quick shower and change into jacket and tie, a swift beer in the bar and then upstairs for the legendary Swinley Forest lunch comprising of a starter buffet of fish in breadcrumbs and many other dishes to pile ones plate high. The main course was a visit to the roast carvery groaning under the weight of lamb, gammon and the most splendid steak & kidney pie all accompanied with a vast selection of potatoes and vegetables. As if this was not enough the puds are just out of this world with treacle tart, apple crumble and treacle sponge accompanied by custard and ice cream. If that does not satisfy your appetite then the cheese board has a good selection to choose from. Following lunch, there was a prize giving for the morning competition (yes believe it or not after all the above there was still more golf to play). The Horners are very generous with their prizes and each par 3 had a closest to the pin prize. This is for the golfer who lands his ball nearest the flag from his or her tee shot on all the short holes. Now it was time for the main prizes. The Horners Trophy can only be won by a member of that Company and was won with a score of 37 points. The guest prize was closely contested with Fueller Dennis Woods coming 2nd with 37 points and Plumber Tony just pipping him on 38 points. With little time to celebrate it was back to business. Russel, overcome with all the excitement, was not due to play in the afternoon match leaving Tim and Dennis to play as a team for the afternoon greensomes competition. The Fuellers were playing with Tony and Danny from the Plumbers so 1st and 2nd place from the morning were pitched against each other. Off to the changing rooms and lots of groaning from both teams when bending down tying shoe laces on very full stomachs. The first hole was a good one for the Fuellers team scoring well but the Plumbers got off to a magnificent start scoring a birdie on the first hole. The game continued hole to hole with the scores going up and down keeping the Plumbers and Fuellers close up until the 15th hole when Dennis hit a massive drive, Tim then took the next shot towards the par 5 green and hit an incredible shot landing it on the green about 25 foot from the pin. It was now Dennis’ turn to putt knowing this was a putt for an Eagle but in fact with 2 shots from their handicap it was the equivalent of a hole in one. Dennis stroked the ball which ran across the green following the undulations and dropping into the hole. You would have thought the Fuellers had just won the Ryder Cup with whooping and hollering and lots of high 5’s. once everyone had calmed down it took a while to calculate the score for that one hole which worked out to be 6 points. With big smiles on their faces our Fuellers team held its nerve and finished the round continuing to maintain a steady score returning to the clubhouse hoping to be the winners. Back in the clubhouse most of the other teams had finished and the talk all around the bar was about the 6 point score on one hole by the Fuellers team. When it came to prize giving it was the Plumbers now in 2nd place 2 points behind the winners; The Worshipful Company of Fuellers. This was the most fabulous day spent with many good friends from other livery companies. It is always a pleasure to play with The Horners who have supported the Fuellers golf day for many years but it was a privilege to be able to enjoy their company at such a wonderful and exclusive golf club. If you would like to be part of the Fuellers team and play in a number of these wonderful golf days please contact Russel Warburton our Golf Society Secretary.